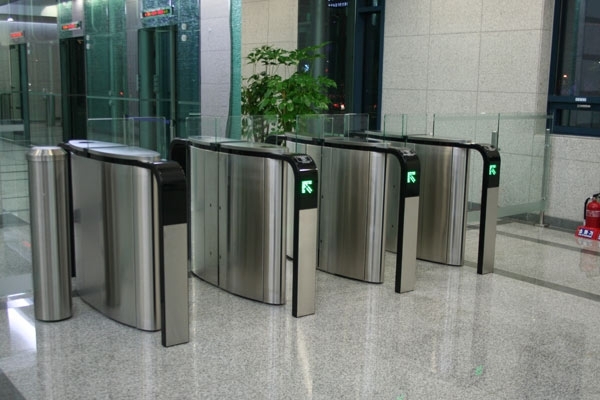 Turnstile gates are commonly used in Singapore to help perform various barrier access management functions through integration with existing security systems. 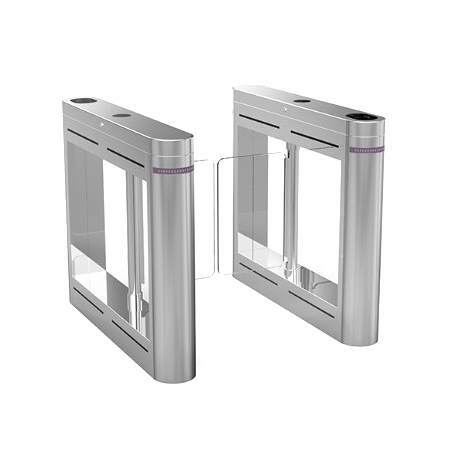 Turnstile gate access control includes various variants, such as Tripod Turnstile, Swing gate, Flap barrier, Drop arm barrier, and Speedgate. Commonly also known as pedestrian entrance control, it is a means or method for metering or controlling people that are entering a building facility or campus premises. At T3 Security integration, we have experience dealing with turnstile projects, such as Full height turnstile, Half height turnstile and have successfully helping clients with physical security and implementing an effective pedestrian entrance control for over 10 years. Typically office building in city center or the busy Central business districts (CBD) areas in Singapore encounters heavy human traffic coming in and out via the building entrance on an everyday basis. The front desk reception staff such as receptionist or security guard that are stationed there have the duty to ensure that everyone who enters into this building truly belongs here and the people that don’t belong there will be filtered out by the access control authenticating solution integrated into the turnstile gate access control. As ensuring building safety and Security became a greater priority, the adoption of physical turnstile gate is getting more common nowadays days. 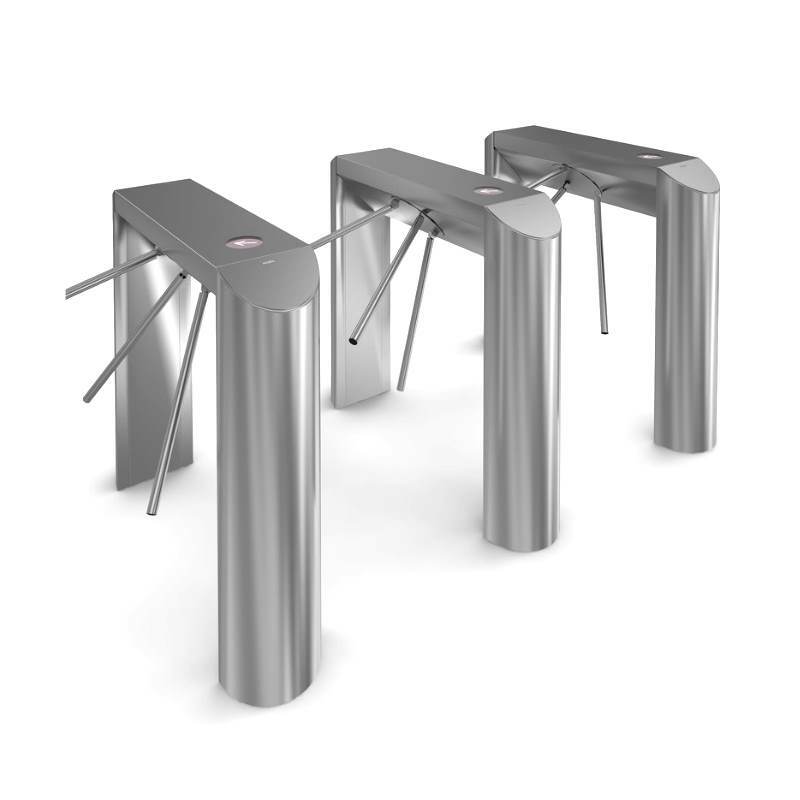 Tripod turnstile is a Cross-functional, and classical design that has a compact overall size. They are commonly installed at Schools, Medical Hospitals, Exhibition & Convention Centers, Museums, Theme parks and Recreational centers. Swing Gate Turnstiles (IP) can be easily interfaced with 3rd party device for a seamless access control system integration. In most standard turnstile, an Access controller and two access control readers are installed into the turnstile body housing. If needed, an optional card capture reader can be installed. Some slim lane Flap barrier turnstiles with Modern architectural design have a purely optical operation and have no barriers. In the event that the optical turnstile detects that the person attempting access through the turnstile is not authorized to enter the building, it emits an alarm signal. Box turnstiles are deployed for intensive operation at the security guard desks of the big companies, such as production facilities. The Professional and Aesthetically pleasing box design of the Drop Arm barrier turnstiles enables them to be used in Corporate environment. Speed gates are suitable for VIP entrances in corporate environments such as Business centers, Corporate buildings, and Banking institutions that need a more comfortable friendly and stylish user entry experience. Full height rotating turnstile gates are frequently installed when it is needed to reliably safeguard against unauthorized passage and heavily enhance the entrance control security. 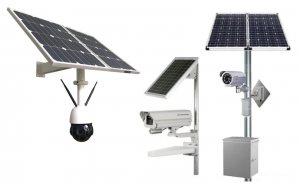 It is used at highly protected sites like factories plants, National stadiums, and Auditoriums. For a comprehensive and holistic implementation of a turnstile solution for effective entrance access control at a company level, it requires the involvement of all key stakeholders within the organization who are closely involved in making the Purchase decisions, Budget allocation, and Schedule time-line as well as the defining the Design process and Technical specifications. Throughput and passage width are important factors when selecting a turnstile gate. The throughput is calculated according to Peak load at the reception front desk. The passage width of the Turnstile lanes affects the convenience and comfort of the visitor experience. * For instance, Tripod generally has a narrower passage width and throughput (persons per minute) compared to Speed gate, which has a wider passage width, and higher throughput. In a standard turnstile setup, the housing unit is installed with identity credential authentication devices (such as an RFID proximity card reader) which works with the retractable physical barrier to ensure only one entry is granted per user authentication. The mechanical turnstiles and Pedestrian Entrance Controls (PECs) are in many ways functionally similar to the access control doors in a typical security access control architecture design. 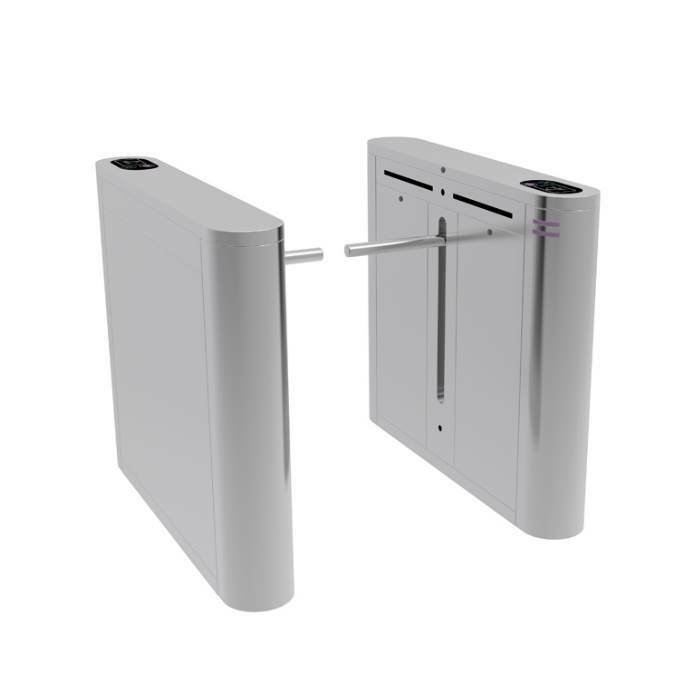 For seamless integration with an existing access control system, our standard turnstile comes equipped with authenticating readers such as Access control proximity card reader, audio alarm with indicator lights to provide an intuitive user feedback functionality. Selecting turnstiles with pre-built-in readers significantly simplifies the installation process and doesn’t disrupt the aesthetic design of the workplace premises. The most popular variant IP-based turnstile offers a complete access control system. It consists of a turnstile with built-in controller and readers or even a card capture reader if needed. Often the case, it’s very likely that these lobby staffs have to handle visitor movement through the use of identity credential authentication before being granted entrance access. 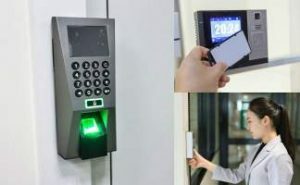 On the way into the secure premises, every visitor has to present their uniquely issued credentials to the electronic authentication reader such as RFID proximity card reader or Biometrics reader (fingerprint, finger-vein, or Facial features) or PIN pad. In a Smart lane optical turnstiles configuration, when the user identity credential is successfully authenticated, the turnstile glass barrier will slide open to clear the lanes for an unhindered passage for the person to walk through. Typically on the way out the exit, our customers do not control visitor exit by allowing an unrestricted free exit configuration. 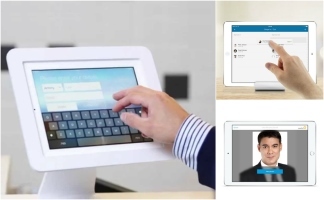 For front desk lobby which is unmanned, where the receptionist staff is stationed physically far away, a high-security access control of the personnel entry and exit movement is usually required. Although there might be CCTV surveillance monitoring on these turnstile lanes and the security staff are unable to respond in a timely manner and intercept in the event there is a tailgater attempt or an incident of a denied entry of an unauthorized visitor. Our turnstile has extended compartments built-in for integration with electronic hardware for enhanced entry and exit detection if required. Built-in smart optical beam sensors allow the turnstile gates to detect, register and ensure that only one person is granted physical access in each entry access session. 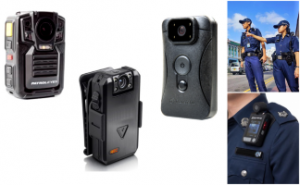 In addition, Smart detection sensors built into the pedestrian access control systems also ensure that bulky items, such as a backpack or hand-carry bag carried by pedestrian do not trigger a false alarm of tailgating attempts. The outer appearance of Turnstile can be tailored to be aesthetically pleasing and can be customized to architecturally blend in with just about any corporate office environment. This enables the lobby to project a professional appearance in the company entrance environment, which is visited every day by VIP visitors, Prospective investors, Customers, and Media. ● Granite stone surface – which can be aesthetically consistent with the granite used in the lobby. 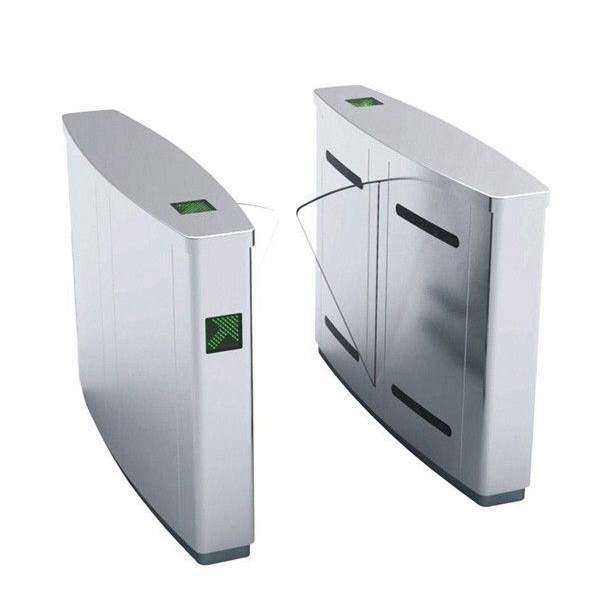 More than a million people pass through turnstile gates every day in Singapore, therefore it is important to choose a turnstile that reliable and also suitable for your pedestrian access control needs. 1. Where on which building premises do you plan to install the turnstile? 2. 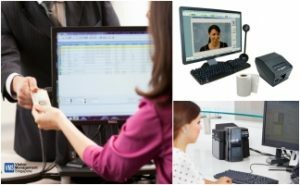 Which security access control tasks does it require to perform and complete? 3. Is it an autonomous turnstile operation or integrated as part of the access control system? The first selection criteria are often the mounting location. These days business centers and banks impose high demands on design and comfort. The solution to this is the installation of stainless steel and tempered glass Speed gates that have quite a wide walkways for comfortable passing or the classic stainless steel Box turnstiles. The entrance to Stadiums, Amusement parks, Water parks is often located in an outdoor environment exposed to harsh environmental conditions, such as Sun’s heat, and rain. It is, therefore, necessary to select all weather turnstiles for outdoor open-air deployment. For unobstructed access for bulky pedestrians, it is possible to upgrade turnstiles by adding automatic glass panels for wheelchair access and passage with baggage. A stream of people at industrial plants is higher throughout the working day, Swing gate turnstiles and Flap barrier turnstiles are installed as it can reliability offer a high throughput over a sustained period of time. Entrances of wheelchair access lanes can also be clearly demarcated for easy differentiation. – Swing Gate, Flap Barrier & Drop Arm turnstiles form a passage area when mounted in a row. – Tripod turnstile – For tripod turnstile, it is necessary to add railing systems to the tripods. Schools, hospitals, governmental facilities are often limited to a budget, besides the turnstile installation site is usually small so it is reasonable to choose a compact tripod. 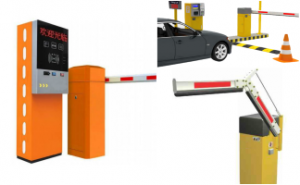 – Full Height Rotor Turnstiles block the whole height of the passage area and are usually installed in specially guarded sites with high security. Another consideration is ensuring compliance with regulatory safety requirements imposed on passage area arrangement at building entrance. Having the safety feature to provide an instantaneous passage clearance for the unhindered escape during an emergency evacuation is a critical safety requirement. It is necessary to not only prevent an unauthorized person passage but also to provide the possibility of the escape route arrangement in event of an emergency building evacuation. This can be achieved in a number of various different methods, such as choosing a turnstile (eg. Speed gates or motorized Swing gates) that provides a wide passage area when the device power is switched off or has an alarm signal option. 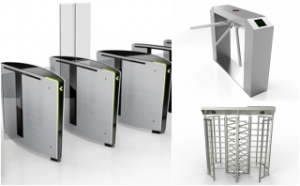 Turnstile equipped with anti-panic barrier arms designs (automatic) or key override control function (manual) will be enough for the small office building facility. Automatic anti-panic barrier arms drop in a vertical orientation when it has received an emergency alarm signal or cut off. In this way, it helps to clear the passageway without the need to use the key or tools. In most cases, it is enough to deploy Waist height turnstile tripods, Box turnstiles, or Speed gates but sensitive facilities require increased security. That can be achieved with full height turnstiles. They not only just fully block the passage but can also work in lock chamber mode. Installation of a canopy can protect against from intruder climbing over the turnstile. All turnstiles must give access privileges for one person not allowing passing one after another using one ID card. One more important selection criteria are the organization’s way of operating. If your guard desk is quite small, let’s say an entrance to a medical center then you can install a turnstile that works autonomously. 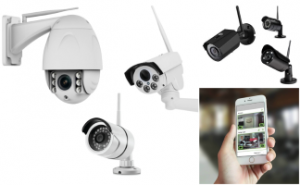 The security guard can easily choose and switch between operating modes using a remote control device. However, in this case, there is a human factor aspect that is not taken into account.A visitor can persuade the guard to let him in without the ID card. 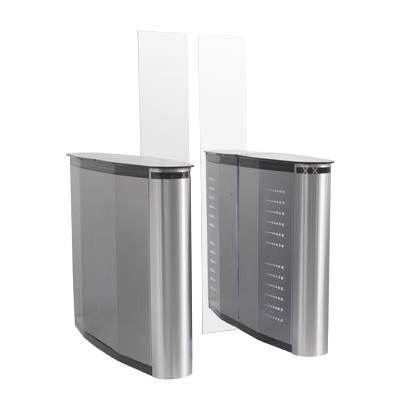 If space constraint is an issue for a smaller sized lobby, turnstile with a slimmer, shorter design form factor can be used. 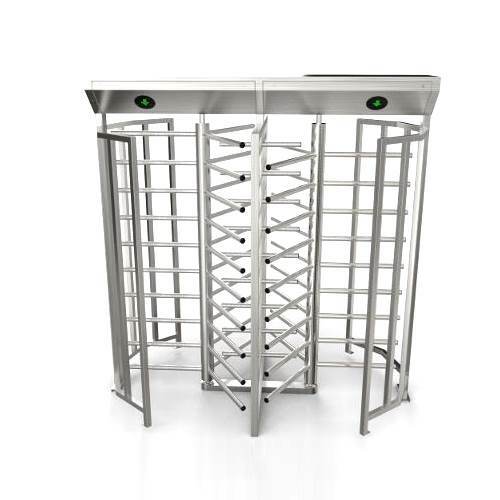 Turnstile is widely used in a range of industry verticals which requires the management of the pedestrian movement direction at Entry and Exit lanes so as to make sure the human traffic moves in the desired direction and don’t come back. Turnstile access control gates have evolved significantly a bit since the early years and its designs have become more sophisticated to more effectively regulate and meter in access of only one person at any one time into the building facility such as Stadium, Concert Auditorium or to any place that required an paid admission fee. Having a turnstile also helps to ensure all passengers have a valid ticket or boarding pass. In recent times, we have seen a rise in popularity of turnstile in various Transportation centers, Subway stations and Airport hubs where it is deployed for controlling the direction of the passengers leaving the facility. Having a turnstile helps to Restrict and Control entry and exit movement of personnel in Corporate buildings facilities or Regulatory environment where Sensitive client data, public security information is stored. We have worked with clients who are in industry domains which are highly regulatory in nature, such as Health-care & Health Insurance field, which is regularly subjected to strict security audits. Due to the high volumes of highly sensitive private client and patient health data that they are responsible for storing, it’s highly critical priority to make sure that those personal data is protected safely inside those buildings. To serve as a deterrent to discourage against Threat of terrorism, which can occur in any place and any time. Having a turnstile access control can help to ensure sure that every person entering the building is authorized and has a genuine/valid reason to gain entry into the company building. Explore what a Turnstile Gate can do for your organization today by calling us at 61008374 for a no obligation discussion of your needs. Have any questions or queries? Our knowledgeable and friendly sales representative will be happy to assist you and share with you in details the benefits & features of implementing a Turnstile Gate system as part of your access control. 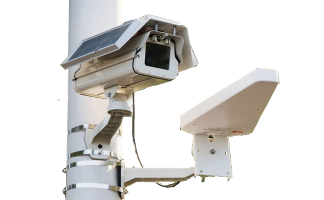 Alternatively, for quote request, simply email us your detailed technical specifications & requirements to enquiry@t3securityintegration.com. 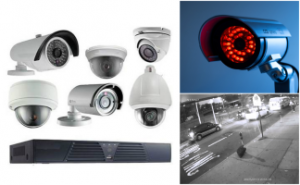 For guidance on installation and maintenance information, you can always contact T3 Security Integration at 6100 8374.